Named for the Oglala band of Dakota Sioux and located on the Union Pacific Railroad, Ogallala was a lusty cowtown of the Old West. From 1875 to 1885 it was a wild woolly cowboy capital where gold flowed across the gaming tables, liquor across the bar, and often blood across the floor. As farmers settled eastern Oklahoma and Kansas, they destroyed the famous Chisholm Trail, forcing the herds westward, and the Western or Texas Trail through Dodge City to Ogallala was established. From Ogallala, Texas cattle were shipped East or sold to ranchers from Nebraska, Montana, Wyoming, Dakota, and Colorado. Indian agencies and mining camps provided an early market for Ogallala beef. Ogallala, the cowtown, was a lively and colorful segment of the American West and the chief gateway to the newly opened ranges of the northern plains. 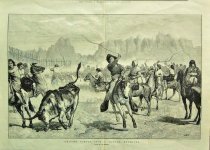 By 1884 the trail driving days were virtually ended and the Old West and Ogallala turned to other ways of life. Cattle remain an important factor in the area along with farming, hydro-electric power and industry. “Cowboy Capital,” Explore Nebraska History, accessed April 18, 2019, https://mynehistory.com/items/show/303.